Though it may sound like something you eat for breakfast, Speckie is an Internet Explorer addon which provides you with a spell checker tool, perfect for forum users with either bad spelling or prone to typos. Speckie is easy to install and gives you the same type of spellchecking available in commercial word processing software such as Microsoft Word or Open Office. 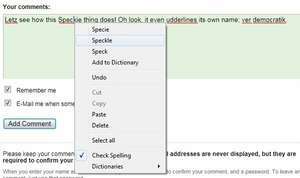 Speckie is fast and lets you know of spelling mistakes in real-time. After you have installed Speckie, it will add two new options to the right-click menu like suggestions. For security reasons, you should also check out the Speckie download at LO4D.com which includes virus and malware tests. Additional screenshots of this application download may be available, too.